Finahub Official Blog: See the real picture, Invest wisely. There are a lot of free investment advice going around these days, celebrity anchors and investment gurus giving investment/trade tips on TV, broking firms suggesting stock selections on social media and TV, investment advisors and analysts giving out free tips through SMS and other means. All this should make investing in stocks very easy and millions of people should have become millionaires by now. Somehow that doesn't seem to happen. It seems more people are losing their money than gain it, why? Making money from the stock market is not an easy thing to do, not even if you are an expert. There too many things that influence the price of the stock, especially in globalized, interconnected market as what we have now. Attempting to time the market is as good as taking a lottery, you might hit it once or twice but not often enough. Investment advice is mostly a guesswork, an educated guess at best. The quality of reach and analysis were done for an investment advice and the timing will determine the odds of it being useful to the investor. It takes a lot of hard work, knowledge and a sense of the pulse of the market to come up with a good investment advice. The best investment advises will contain a piece of information which has not been fully factored into the price yet. Once the new information is factored into the price, the advice becomes useless. In this age of internet and mobile technology, information travels at the speed of light. So any "investment advice" that is given out in public domain is useless because it would have been already factored into the price. The people who are giving out free advise know this better than anyone else, but still, they do it. They do it because they know that there are people out there who want to make easy money. These advisors know that people are naive enough to believe that they will get free investment advice over the public domain. The hard fact is that there is no such thing as a free beer, let alone free investment advice. 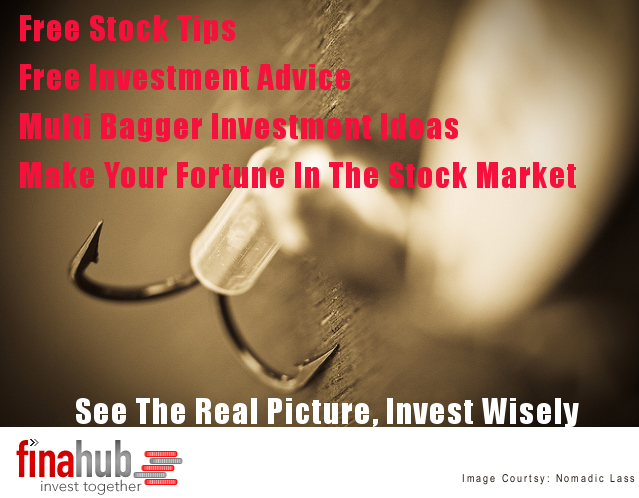 All this free investment advises are bait, hook, line, and sinker put in place so that advisor can make gains. Buy into it and you lose money. The best thing to do is to ignore all the free investment advise, stock suggestions and trade calls. Do your own research but if that is too much trouble, invest in ETFs or mutual funds. You can also consider asking your broking firm for help. You should be able to work out some deal or value-added services that will help you in making a good investment.